Dirt Bike riding can be a dangerous sport, but its as dangerous as you make it. With a few simple steps, you can dramatically reduce the chance of injury. Riding through the forest on a dirt bike is an exhilarating experience, but you need to be careful about how you ride and how you prepare. Of course, anything that’s exhilarating has its risks. The same could be said for riding BMX, playing football, surfing, even swimming at the beach. 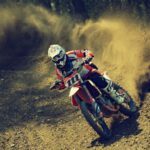 Statistically more than half of the dirt bike injuries resulting in a hospital stay are from racing at an official track. My own experience is reflective of that. I have broken my collarbone twice, ankle, and wrist, and all while competing on a track. I have never broken a bone trail riding, so if you only use a dirt bike for trail riding, your risk is dramatically reduced. If you’re a parent and are considering letting your kids get into dirt bike riding, should you be concerned? Of course you should, but at the same time, you can’t wrap them in cotton wool. You don’t want to kill their adventurous spirit. Sure, there are safer ways for them to have fun, like playing on their ipads or computer games. Getting them off of their devices and outdoors having some fun is every parent’s challenge these days. If you already ride dirtbikes yourself and are looking to ride as a family, you already have a pretty good idea of how to reduce the dangers for your kids. There are some things you can do to minimize the dangers as listed below. If you’re considering ATVs as a safer alternative, you may be interested to know that statistically, you’re a lot safer on a dirt bike than an ATV. The perception is that ATVs are safer than dirt bikes because they have four wheels and therefore must be more stable. 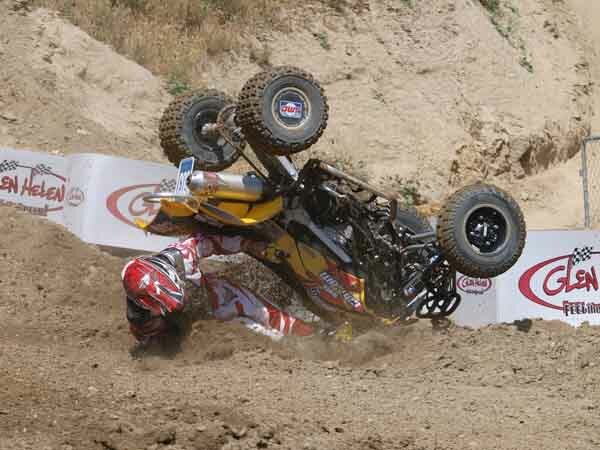 An ATV is heavier than a dirt bike and the chances of the ATV rolling over and crushing the rider are very high. A four-wheeler often weighs between 650 and 850 pounds, combine that with the momentum of speed and you can see why there are more injuries than with a dirt bike. With a dirt bike, you tend to get thrown clear of the bike, not have it roll over on top of you. Statistically, ATV riders are far less likely to be wearing the full safety gear. Maybe this is because riders are assuming they’re safe on four wheels. Keep away from ATVs altogether and you’ve reduced the risk by 50% already. Avoid riding on paved roads. Stick to riding in the dirt. Other vehicles don’t see motorcycles. It’s not a matter of how skillful a rider you are, it’s pure chance if you get hit by a car. My worst dirt bike injury happened on the road. Choose the right bike for you. Don’t be in a hurry to jump up to a heavier more powerful bike too soon. Wear the right dirt bike safety gear – all the time. The one time you don’t wear it is the time you’ll need it. Dress for the crash, not the ride. Your helmet is the most crucial piece of equipment, it protects your brain. Stay away from racing in competitions. At the risk of sounding like the party-pooper, more than 50% of dirt bike injuries requiring hospitalization happen in competition. Ride within your ability. This is a pretty obvious one but goes a long way to avoiding injury. Pushing the boundaries on a dirt bike can be a dangerous game. Stay on designated trails, they are designated for a reason. Inspect your bike before you ride. Check tire pressures, make sure the brakes are working. Check all the controls to make sure they’re working and not loose or broken. Stay Sharp. You need to be able to make quick decisions and adjustments. You may encounter unexpected things in the woods, like a wild animal (Kangaroos if you are in Australia), another rider or 4WD vehicle. Avoid getting dehydrated, it can affect your focus. Ride with a hydration pack. Never mix Alcohol or drugs with dirt bikes. Alcohol is a factor in about half of the fatalities. Minimize the risk. There is always some risk riding off-road motorcycles. Its a powerful machine with minimal safety features, but you can limit the risks. Always ride with at least one other person. If you crash in the woods and need assistance to get help, a riding buddy can be a good safeguard. It also makes riding more fun. Always ride in the daytime hours, not at night. It’s harder to make out the contours in the trails a night. It helps to be aware of the most common types of injuries in order to take steps to avoid them. 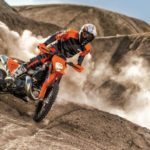 If you’re thinking of getting into riding dirt bikes, here is a list of some of the most common injuries, and some suggested riding gear that will help minimize an injury. Knee injuries. There are four major ligaments – ACL, MCL, LCL, and PCL. The ACL (Anterior Cruciate Ligament) is the most commonly injured ligament. Always ride with a motocross knee/shin guard at the very least, even just trail riding. If you have had a previous knee injury that you need to protect, or just want to avoid it in the first place, a knee brace is the best you can do for knee protection. These are very commonly used by motocross riders. One of the best available I can highly recommend is the CTi knee brace. These are supplied and fitted for the rider by none other than Australian Yamaha motocross legend Stephen Gall of Gall Bros. Medical. Shoulder injuries. The rotator cuff and the tendons and muscles surrounding it are another very common injury. Dislocations are also fairly common with motocross riders, and many ride with a dirt bike shoulder brace if they have had a previous injury needing extra support. Collarbone breaks. A common one that I am all too familiar with. It’s not a serious injury and means a few weeks with your arm in a sling. When you fall from a bike, if your arm is the first thing to hit the ground, or if you land awkwardly, the collarbone is the first thing to break. 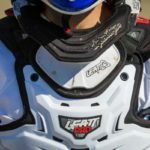 Wearing a dirt bike neck brace may provide some protection, in addition to the neck protection. Earlier neck braces that rested on your collarbones have been thought to be responsible for collarbone breaks, but a good neck brace these days sits up off the collarbones, so the problem has been solved. Acromioclavicular (AC) joint injuries. The AC joint is the joint where the collarbone and shoulder blade meet. An impact from a fall can cause a strain of the ligaments. Again, riding with a shoulder brace may provide some protection. Wrist and Ankle injuries. Sprains are the result of ligaments being stretched beyond the normal limits. Ankle sprains are very common, often caused by the weight of the bike coming down on your ankle or impacts with rocks or tree roots. Ankle braces are available, but nothing is better than a good pair of Off-Road boots, even for trail riding. 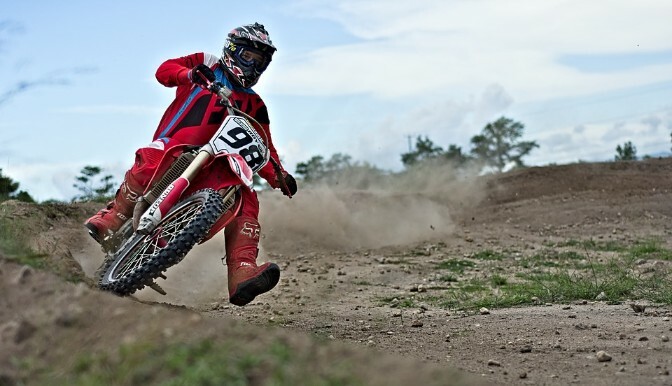 Dirt Bike elbow guards and wrist guards are available to protect your wrists, forearm, and elbows. Dirt Bike riding can be a dangerous sport, there’s no getting around that. But if you make a few simple changes to the way you ride, and how you prepare, it can be a great family activity. Simply by sticking to trail riding, avoiding road riding, choosing the right bike for you and wearing the right gear when you ride, not drinking when you ride, you’ve minimized the chance of serious injury to a small percentage of what it was. None of this stops your enjoyment of the sport, most of it is just common sense. 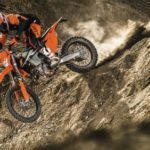 What are your thoughts on Dirt Bike Safety? Please feel free to leave your comments below. I love dirt bikes but no matter how enthusiastic I get, there’s always a part of me that’s super scared of falling and thankfully, im lucky that I’ve not fallen yet. But just out of curiosity, are dirt bikes actually okay to be used on paved roads rather than on dirt? Hi Riaz, yes, most dirt bikes can be road registered. It’s just motocross bike built for racing that have no lights etc and can’t be ridden on the road. Falling on the dirt is just part of it, that’s why we wear all the protective gear. Hi Lok. If you do get a chance to try out dirt bike riding, just follow those simple precautions and you should be right. In over 30 years of riding I’ve never had any serious injuries trail riding. Thanks for your comments. This is such an informative and well written article. Even though I am quite feminine, I have thought that I would like to ride a dirt bike. Although the injuries don’t sound appealing, something about riding them seems fun and adventurous. I’ve fractured one of my ankles twice and wasn’t doing anything close to this exhilarating. Hi TaN. That’s right, you can injure yourself doing almost anything, but you have to live a little don’t you. Hi Evald, glad you found the info helpful. Great that you’re getting into dirt bikes. There’s just a few things to do to avoid injuries, it’s all pretty much common sense. Thanks for your comments.